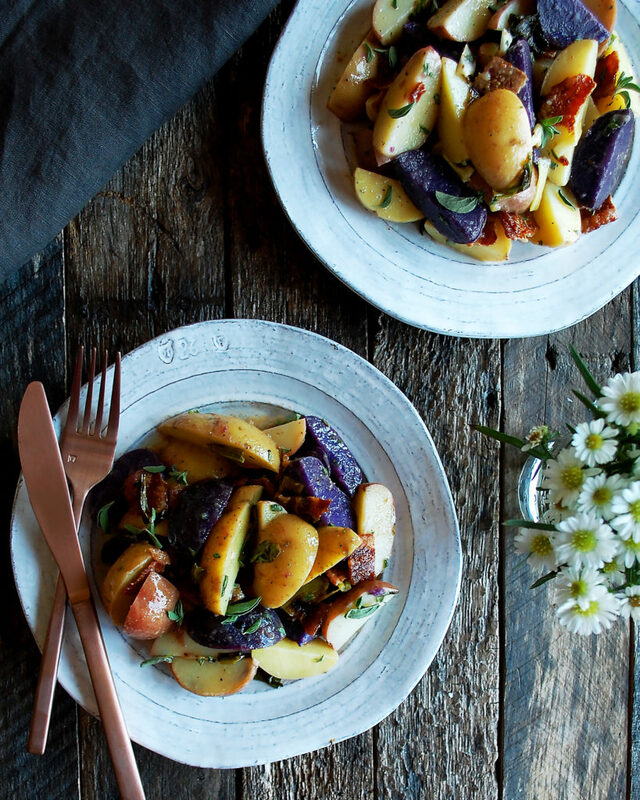 A simple, classic warm potato salad with the most intriguing bacon & charred green onion vinaigrette. Happy St. Patrick’s Day, everyone! 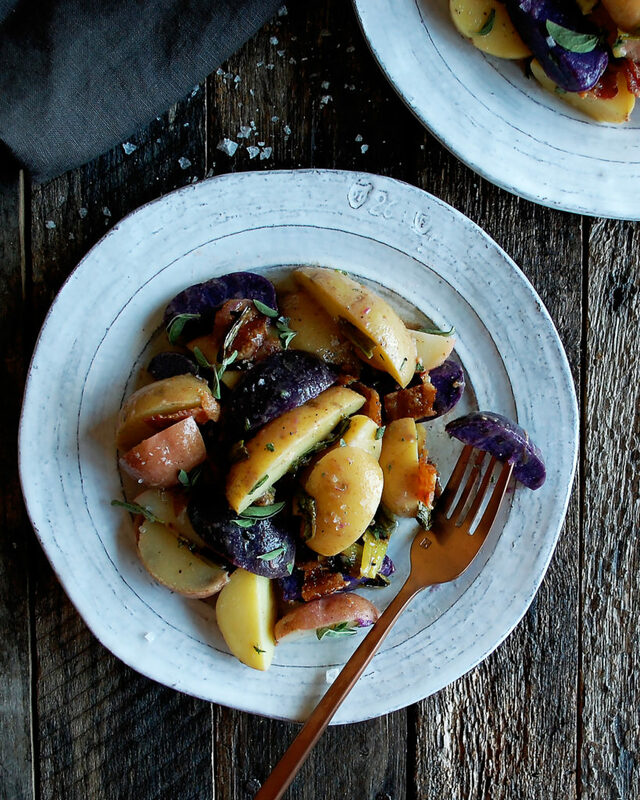 I’m sharing a really simple warm potato salad recipe today with lots of bold flavor. And I mean, you always need some good potatoes for your Irish feast. 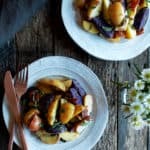 The trick with this dish is to cook the potatoes until just tender, which is typically a very fine line. The rate at which your potatoes cook will vary depending on the size of pot you’re using, how much water is in your pot, the variety of potatoes you’re using, and the size of your potatoes. You’ll want to work on finding the sweet spot of cooking times to make sure the potatoes come out firm and tender, without being mushy or dry. 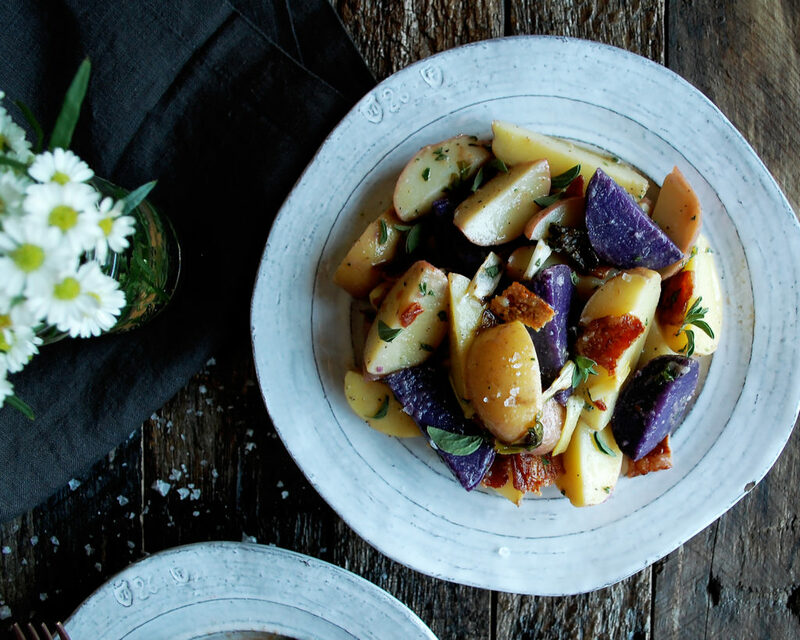 Once you’ve got that down, all the potatoes need is a rich and tangy bacon & charred green onion vinaigrette. Bacon and potatoes pair perfectly together to begin with. And then the charred green onions just add that extra layer of flavor. Definitely would recommend using the vinaigrette in other ways if you have extra, like spooned over seared, thinly sliced flank steak or tossed with greens and crisp vegetables. 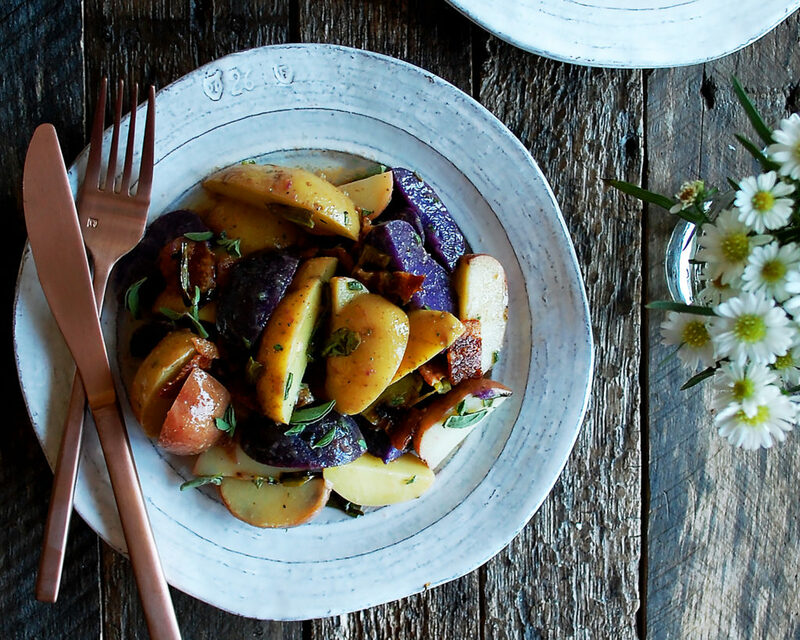 It would actually be the PERFECT substitute vinaigrette for this rustic winter salad… totally have to do that now. And with that, I hope you have a wonderful day and enjoy all the St. Patrick’s Day food. I’ll be digging into these stout braised short ribs tonight, as well. Preheat the oven to 350F. Lay the bacon on a foil-lined sheet pan. Cook the bacon for 25-30 minutes until crisp. Transfer the bacon to paper towels. Reserve the warm bacon fat. Meanwhile, heat the grill or a cast-iron grill pan over high heat. When hot, coat the green onions in a little oil and season with salt. Grill the green onions until tender and charred. Transfer them to a cutting board and roughly chop, discarding the root ends. In a mixing bowl, whisk together the sherry vinegar, Dijon mustard, and Worcestershire sauce. Slowly drizzle in the oil and bacon fat until the mixture is emulsified. Whisk in the lemon juice, fresh oregano, salt, and a few cracks of freshly ground black pepper. Stir in the chopped, charred green onions. Meanwhile, add the potatoes to a large pot and cover with cold water. Bring the water to a boil and add a large pinch of salt. Reduce the heat to medium-low and simmer the potatoes for 12 minutes, or until just tender. Drain the potatoes. Using a sharp paring knife, cut the potatoes in half lengthwise. While the potatoes are still warm, toss them with the vinaigrette. Add a little bit more salt to taste, if needed. Plate the warm potato salad and crumble the bacon over top.